Levels of PM2.5, the tiny airborne particles considered most harmful to health, reached 1,157 micrograms per cubic metre in Liaoning province’s Shenyang on Sunday, data from the city’s environmental protection bureau showed. The level that is considered safe by the World Health Organisation (WHO) is 25 micrograms. “As far as we are aware from the data we have been observing over the past few years, this is the highest ever PM2.5 level recording [in the country,” Greenpeace campaigner Dong Liansai said. PM2.5 particulates can play a role in heart disease, stroke, and lung ailments such as emphysema and cancer. 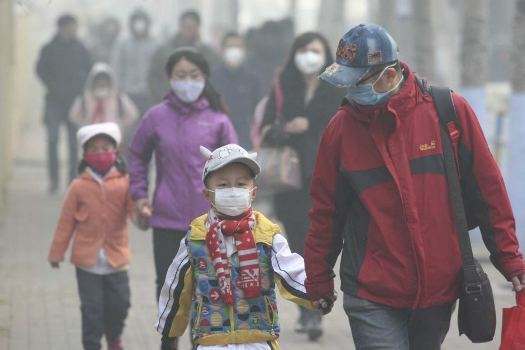 In nearby Changchun, the capital of Jiln province, levels reached 860 micrograms per cubic metre on Monday. Photos posted on Chinese social media showed thick grey smog blanketing cities across the region.